This a movie review of RATATOUILLE. High-five to the ladies and gents at Pixar! They, like Japan’s awesome Studio Ghibli, demonstrate with deceptive ease what happens when story and dialogue are pushed to the fore. Every film-maker should look to these two animation houses for how to make original entertainment without setting the standard to appeal to the lowest common denominator. Ambition, talent and hard work clearly merge. The entertainment begins before even the credits roll with the habitual short film. Lifted is about a young alien learning to use a flying saucer to abduct humans – it is full of wit, and like a great warm-up act puts a smile on your face for the main event. Brad Bird is a great director full stop. He has a fantastic grasp of comedy and action. 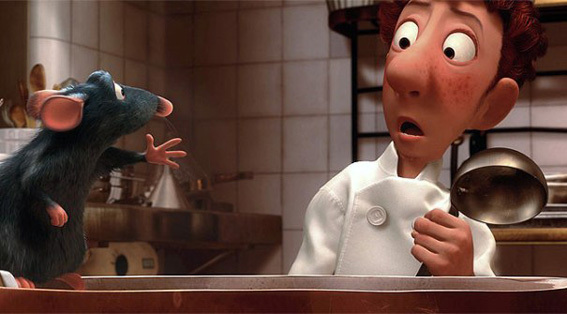 RATATOUILLE may not be as good as his previous effort, THE INCREDIBLES (but then what is? ), but he packs so much detail into each frame without overloading it – a real feast (ahem!) for the eyes. 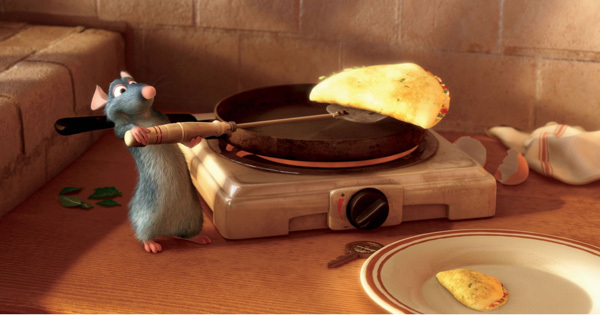 There is a rat-a-tat (sorry!) of running gags, e.g. Remy is scurrying in the ceiling and spies a French couple arguing, the woman fires gun but is held at bay by the man, and then they kiss as though the fight was foreplay to passion. It is a sly dig/admiring nod at the French in particular, and romance in general. There is also a fantastic reference to the Proustian notion of remembrance of times past. Aardman Animation’s FLUSHED AWAY has taken a little away from the originality of the movie, but cinema is littered with pairs (VOLCANO, DANTE’S PEAK; DEEP IMPACT, ARMAGEDDON, etc.). My only complaint is that Pixar’s characters have to learn a lesson (except the truly immoral), which feels a bit trite sometimes. Studio Ghibli’s work (SPIRITED AWAY, MY NEIGHBOUR TOTORO, PORCO ROSSO, etc.) have grander sophistication in this regard. 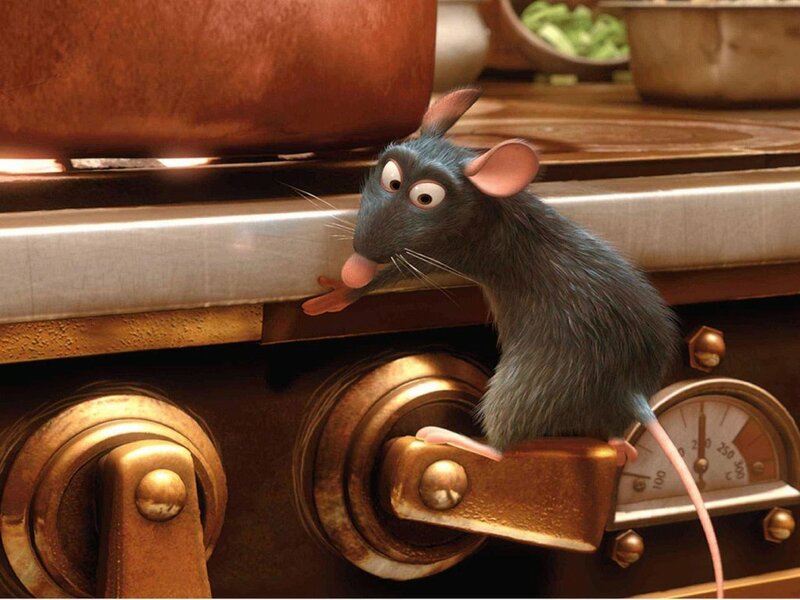 There is a visual kinetic energy to Ratatouille, as well as a wonderful appreciation of architecture and food. I would love to see a Brad Bird live action feature film!